There are times when a class needs to be serious and students must learn about grammar and testing, but other times a class becomes quite funny. 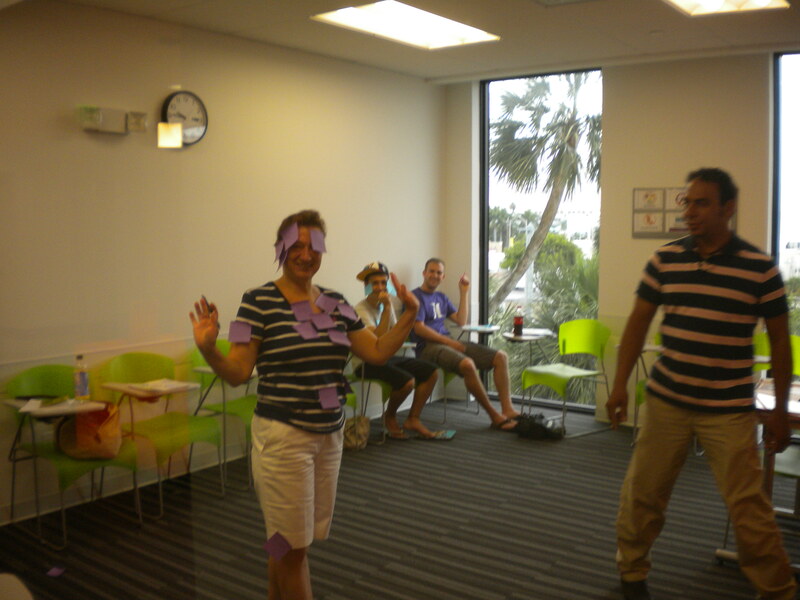 Using active games is a great way that teachers at EC Miami encourage students to learn new vocabulary and interact with English in a different way. A great example of this is a game that Eric played with his low-intermediate class recently to help them remember vocabulary related to clothing. The EC Miami students were split into teams of two and one student from each team was the mannequin while the other student was the dresser. A mannequin is a fake person in the windows of clothing stores that wears the clothing the store is selling. In order to “dress” the “mannequin” the dresser had to put sticky notes with clothes words written on them on the correct places of their partner’s body. 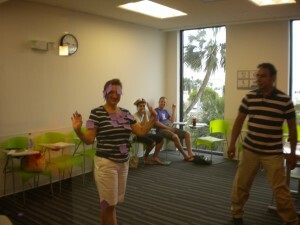 It was a competition to see who had the highest number of sticky notes on his/her body. In the end, it was a funny game for everyone, especially for the teacher, Eric who got to see his students covered in colored notes. The “prize”, according to Eric, was two hours of good luck for the day, but they were only available from 3-5 p.m. With a silly prize and a fun game, Eric showed the students that studying vocabulary is not always boring!